If you’ve picked western Colorado as your hunting grounds this season, you couldn’t have chosen a better spot to set your sights. The Pacific-most portion of the Centennial State harbors the two key ingredients all hunters look for: some of the largest elk herds in the country, and extensive public lands. This equates to one of the best chances of filling your tag of anywhere in the country. Petch estimates that there are about 280,000 elk in Colorado, the most of any state, with more than 15 percent of those harvested every year. Other big game populations are also strong, including mule deer, moose, pronghorn, bear and mountain lion. From Grand Junction, head out onto Grand Mesa (units 41, 42, 411, 421, 52 and 521 for over-the-counter elk) and the Uncompahgre Plateau (units 61 and 62 for elk), as well as the Gunnison Basin (units 76 and 77 limited elk). Afterward, tour through Grand Mesa or Colorado National Monument. Farther northwest, Dinosaur National Monument offers a glimpse of the region’s prehistoric past amidst world-class pronghorn options. The region also contains Brown’s Park on the Green River, offering world-class trout fishing below Flaming Gorge Reservoir. Just off U.S. Highway 40, Rangely is another sportsmen’s hotspot whose hilly landscapes are populated with deer, pronghorn, elk and small game. Craig, the seat of Moffat County, continues to be ranked as one of the top hunting destinations in the country for its vast public lands, private ranches and herds. From Craig, Colorado Highway 13 heads north toward Wyoming and south to hunter-friendly towns like Meeker. Everywhere you go is prime hunting habitat. East of Craig on U.S. Highway 40 is Hayden, also rich in ranching and hunting heritage, and another 30 minutes east is Steamboat Springs, the seat of Routt County. Known for its world-class ski area, Steamboat also is home to fifth-generation ranches and some of the best trout fishing and elk, deer and moose hunting in the state. South of Steamboat on Colorado Highway 131 lie Oak Creek, Phippsburg and Yampa, the “Gateway to the Flat Tops” and the wilderness area’s prime hunting habitat. Across the Continental Divide, North Park is also known for its moose and fishing. Located an hour drive on Colorado Highway 14 from both Steamboat and Laramie, Wyo., Walden is the region’s largest city and surrounded by extensive public lands. Farther south are the hunting hotbeds of Kremmling, Hot Sulphur Springs and Granby, which also carry vast herds of elk and deer. 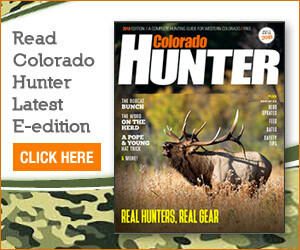 So no matter where your crosshairs are set in western Colorado, you’re ahead of the game when it comes to hunting.